The wonderful town of Lucca is situated in the northwest of Tuscany, only 20 km away from Pisa, about 90 km from the Cinque Terre. The town itself rests on a plateau under the watchful gazes of the Apuane Alps. The medieval walls, thick and strong, built in the sixteenth century still surrounds the town and the walkways present on the top of the walls offer an enjoyable opportunity for biking or walking to nearby sights. • Duomo di San Martino - Cathedral of St. Martin isthe grandest example of the Pisan-Lucchese Romanesque school of architecture. The construction of the cathedral began in 1060. The impressive interior design was largely undertaken Matteo Civitali, the most famous Luccan sculptor of the early Renaissance. He created the pulpit, pavement and the holy water stoups. • Museo della Cattedrale - The Cathedral Museum with art from the nearby cathedral and valuable treasury including embroideries, tombs, silver church objects, sculptures and pictures. • San Michele in Foro, this church is as beautiful as a 12th-century Romanesque church can get. It boasts a Pisan-inspired facade of blind arches with lozenges and colonnaded arcades stacked even higher than San Martino's. • The city walls are Lucca's defining characteristic, and they make up a city park more than 4km long and about 18m (59 ft.) wide, filled with avenues of plane, chestnut, and ilex trees. The shady paved paths of Lucca's formidable bastions are busy year-round with couples walking hand in hand, tables of old men playing Italian card games, families strolling and hundreds of people on bicycles. Rent a bike and take an afternoon spin, peering across Lucca's rooftops and down into its palace gardens and narrow alleys, gazing toward the hazy mountains across the plane, and checking out the 11 bastions and 6 gates. The Porta San Pietro, the southerly and most important gate into town, still has a working portcullis. • Climb the tower of Palazzo dei Guinigi (230 steps) for a spectacular view of Lucca's skyline with the snowcapped Apuan Alps and the Garfagnana mountains in the distance. 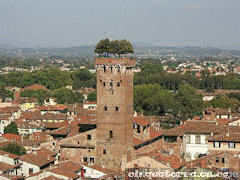 On the top of the tower there is a garden with several oaks. 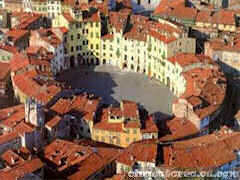 • In the surroundings of Lucca you can visits wonderful villas and gardens. One of them is the Villa Garzoni in Collodi with it’s beautiful Baroque garden with pools, waterfalls, statues and a maze. Don’t miss the nearby Pinocchio Park. 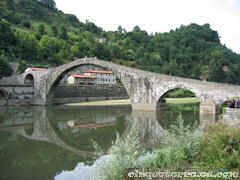 In Borgo a Mozzano you can visit the 11th century bridge Ponte del Diavolo (Devil's Bridge).